Description - The Brand name of this medicine is Intacept . 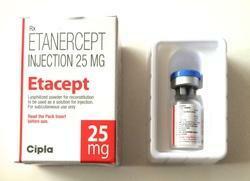 Intacept medicine contains generic Etanercept. 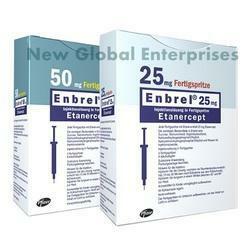 Etanercept are available in form of Injection. Each vial contains 50Mg Etanercept. One Pack of Intacept contain 1 vial. Manufacturer And Marketed company name of Intacept is Intas Pharma Ltd, India. Intacept 25 Injection is an immunosuppressive agent used to treat autoimmune diseases like rheumatoid arthritis, psoriatic arthritis, ankylosing spondylitis, plaque psoriasis, and juvenile idiopathic arthritis. This medicine is not recommended for use in patients with active serious infections. Etanercept Medicine is used alone or with other medications to relieve the symptoms of certain autoimmune disorders (conditions in which the immune system attacks healthy parts of the body and causes pain, swelling, and damage) including. - Manufactured by: Cipla Ltd.